It is quite common to hear or see people include the Bible as just another piece of ancient near east mythology that may be rejected as having no applicability to reality. John Oswalt decided to investigate this claim and address it directly in his book The Bible Among The Myths: Unique Revelation or Just Ancient Literature? (Kindle, softcover, promo video). This book comes to me by recommendation of several people, and the introduction alone sparked great excitement to dig in quickly and deeply. This review will be a chapter-by-chapter summary and will include some of my concluding thoughts. Oswalt begins by providing the historical context. He takes the reader quickly through Greek philosophy, which was based on the idea that something cannot be and not be at the same time (the law of non-contradiction). The Greek philosophers struggled (and lost) for acceptance of this radical idea in their culture. At roughly the same time the Hebrew idea of a single God, who created the universe, (an idea also unique among cultures of the time) was under attack in the mind of the very people who carried the tradition because of the rising military powers, which affirmed contradicting theologies, that eventually overtook the nature of Israel. However, this "set the stage" for Jesus Christ to come on the scene and bring these two culturally independent yet correct understandings of reality together into one consistent worldview that is now known as "Christianity." A single God, who created the universe, is the metaphysical foundation for the law of non-contradiction that his creation (and the rest of reality, for that matter) adheres to. The Christian worldview was necessary for logic and science to fully develop and fully function (seemingly) independently. Many people want to classify the Bible as myth. However many definitions for "myth" exist. If one is to place the Bible in a mythical category, it must be determined which one. Oswalt takes the reader through many different definitions that can all be classified into two primary types: historical-philosophical and phenomenological. The first defines myths by truth value or function value of the story, while the second focuses merely on ascribing human characteristics to nature to explain it. Oswalt compares the purposes and philosophies of the different definitions. He explains that some of the definitions are so broad that they include stories that are not accepted as myths, while others are so restrictive that they exclude stories that are accepted as myths, but they all capture some elements of myths, so it is difficult to determine which one is the best. 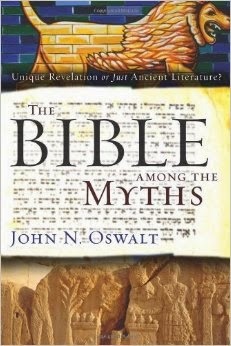 Oswalt, though, believes that landing on a single definition is not necessary to determine if the Bible truly is myth. Rather it can be determined if necessary characteristics that are common to all the definitions can be identified and shown to be either present or not in the Bible. One such necessary characteristic common to all the definitions is the idea of continuity- meaning that all distinctions within reality (including individual objects) are illusions- only one reality exists, and the goal of existence is to lose all distinction (say, between the reader and a tree) and be one. This is the necessary characteristic of all the possible definitions of myth that Oswalt will test the Bible against: does the Bible teach such a worldview? If the Bible does not teach this worldview, it cannot be classified as myth, regardless of which definition one wishes to use. The foundational worldview found in all the myths is pantheistic in nature. It has continuity between nature, humanity, and the divine. This means that there is no distinction among them, and whatever is done or happens to one is done or happens to the other. There is no such thing as true individuality; all is one, and one is all. Owsalt explains that this view, among other things, allowed the ancients a certain amount of security in the idea that they could control nature simply by performing some ritual or doing something to or near idols of the gods (the gods each represented a different feature of nature, but in a very human form). He emphasizes that this way of thinking about the metaphysical was the result of taking what is observed in life and extrapolating it to all of reality, including the metaphysical. Oswalt describes nine different logically necessary implications of this kind of worldview. In his investigation to determine if the Bible is, in fact, myth, he will examine biblical teachings for these features. If these features are not present in the Bible, then it cannot be reasonably categorized with the myths of the ancient near east. Oswalt builds upon the ending statement of the previous chapter by examining several attributes of the worldview that is presented in the Bible and begins to contrast them with the worldview of mythologies of the ancient near east. The foundational understanding of the world that distinguishes the two is transcendence (the Bible- God, humanity, and nature are separate) and continuity (ancient near-east mythology- all are one). Transcendence has many necessary implications that are present throughout the Bible: Monotheism, the understanding of God in the Bible; iconoclasm, the prohibition of representing God view material objects such as statues; spirit, spirit is prior to everything else, including creation; creation outside of conflict, creation took place by the will of God, not as collateral damage of a divine domestic dispute; high view of humanity, humanity was created in the Image of God, thus is valuable beyond simply what they can do for the gods; reliability of God, God does not lie; and magic is prohibited, since God and creation are separate, attempted manipulation of God through actions on nature are not possible. The idea of transcendence also takes morality beyond merely commands of the state, but makes people accountable to the supreme, personal Being for the choices they make, whether the state permits a behavior or not. Ultimately, the idea of transcendence leads to the fact that life is not about the individual, but about the Creator. The mythologies of the ancient near east are radically different in that they are focused on the "individual" being allowed to do whatever they will and get whatever they want without any consideration of moral consequences or effects on other intrinsically valuable individuals. Since the worldviews of both have been established with a little bit of comparison here and there, Oswalt now goes into a more direct approach to contrast the two worldviews. He makes the point that while there are similarities between the expressions of the worldviews, those cannot be used to say that the worldviews are the same because the foundations of the worldviews are in direct conflict. Many skeptics like to argue that similarities in expression are powerful evidence that the worldviews are the same (or, at least, started from the same point of continuity); however, Oswalt makes the point that because of the contradicting foundations, the similarities are merely trivial; it is the differences that are important. He addresses the differences between the ethics within the two worldviews, but he spends the majority of the chapter speaking to the similarities because of their popularity in skeptic circles to explain away the worldview of the Bible. He specifically addresses common arguments that support the ideas that passages in Genesis, Psalms, Isaiah, and Habakkuk specifically reflect the worldview of the ancient near-east mythologies. He does not deny that the similarities exist or that they are completely insignificant, but that the similarities are rather evidences that the Israelite people were attempting to communicate their unique worldview to their neighbors in language and concepts they were used to- a kind of "cultural apologetics," if you will. Oswalt now turns his attention to the idea of history. He begins by explaining that history does not have as many possible uses as does myth. The understanding of history that will be used to identify if ancient mythology and/or the Bible are history is, the recording and analysis of past human events with the expressed purpose of discovering mistakes and altering behavior to prevent them in the future. Oswalt describes different writings from the ancient near east that do record past human events. However, he notes that these focus only on the kings' victories in battles and great accomplishments. Because failures are not included, there is nothing to for the writers to analyze for future changes. In the first part of the book, Oswalt explained how the worldview of ancient mythology (continuity) does not allow for the alteration of the future, focuses on the present, a nearly infinite number of causes for events, and a lack of purpose, good, or evil. There exists no mechanism for reliable analysis, no way to act upon the analysis, and no need to act on any analysis. Based on all this, we should not be surprised at the lack of history in the ancient near eastern cultures' records of past events. On the other hand, the Bible holds the worldview of transcendence, which allows for past human choices that can be traced to a certain event to not be repeated if the event was undesirable. Oswalt explains that the Bible teaches that God has a purpose for his creating the universe and humans. So, any decision that is made against God's purposes is evil. Man possesses free will that allows him to consciously choose to act in accordance to God's purposes. Not only does the Bible have a worldview that has a mechanism for analysis, but it has both a reason to act and a mechanism for acting upon the analysis. Having a foundation for historical content is not enough, though. The Bible must contain historical content, but does it? Oswalt presents several evidences of argumentation to conclude that it does. The first, if God has in fact revealed himself through nonrepeatable events in history, it is imperative that the records of these events be accurate for future generations, since those generations will not experience them. The second, the Hebrew worldview included that this God is the judge of all, including the recorders of the events; if the recorders falsified the events (for whatever reason), they would be judged. The third, interpretations of any event or observation depends on the facticity of the event or observation. The fact that interpretations of events are included lend credibility to the idea that the events actually took place (why interpret if they did not happen?). Oswalt is careful to explain that the standards of recording of past events in Israel is not to be compared to today's standards because the purposes of the two are not the same. Israel's purpose was to communicate information about God; thus only necessary information of the events was included. Every detail was not necessary to be recorded to explain how the event pointed to God. The lack of detail cannot be used to reject the interpretation, but the interpretation (and the events recorded) do not necessarily allow for a precise reconstruction of the event. as if it were video taped. The facticity of the details recorded is important, but uncertainty in the details not recorded is not. The evidence points powerfully towards the accuracy of the historical claims of the Bible, and the Bible's lack of today's expected level of specificity of historical records is not enough to overcome the evidence. Some scholars still argue that the Bible does contain incorrect records of the past. Assuming that future sholarship does not vindicate the biblical records, a couple theories have been proposed to separate the records of past events in the Bible from its interpretation of those events (theology), in an effort to preserve intellectual acceptance of the theology should the records of the past events be shown to be inaccurate. The first is of Rudolph Bultmann. Bultmann attempts to accomplish this by removing two distinctions: subject and object, and the event and its interpretation. He offers that there is no way to objectively know what happened in the past; all "history" is only subjectively experienced- not known. This would allow the interpretation, given by the individual, to be separated from any dependence upon an actual event. So, asking if the Bible contains historically accurate records is actually useless. However, Oswalt explains how such distinctions are not possible. The second is called process theology. This idea is that God is not transcendent, but rather is the process of history. As pantheism makes God equal to the creation, process theology makes him equal to the unfolding of events. In this view, God is not transcendent, thus there is no purpose by which to evaluate the progress of human events towards a goal. As established in previous chapters, this is not what the Bible teaches about God, so this is not a viable alternative. Oswalt concludes that the accuracy of the recorded past events and their interpretations presented in the Bible are inseparable. Implied throughout the book up to this point is that the worldview of the Bible is so radically different from the worldview of the ancient near east that there is no logical thought connection that could lead from the continuity of mythology to the transcendence of the Bible. Some skeptics accept can accept the critiques presented through this book but still believe they can tie Israel to ancient near east mythology. This is not accomplished by way of the content of the Bible, though; rather it is attempted by saying that Israel had a worldview of continuity and it evolved over time to be a worldview of transcendence (in practice and/or in written form). Oswalt explains and critiques four unique models presented by scholars and concludes that none of them are supported by the evidence as much as the explanation of the worldview of transcendence being originally present in Israel, thus is the original source of the records in the Bible. As is argued in the above chapters and established by the failed attempts in this chapter, there is no logical pathway for continuity to evolve into transcendence. Thus if Israel believes in transcendence today, they believed it then; and if the Bible teaches transcendence today, it taught it then. There is no way to link the Bible to mythology. Oswalt concludes the book with a short summary of the contents and a list of predictions about the future state of a culture that rejects the idea that the Bible is history. Some of the predictions are being realized today, while others are not yet but may have the potential to be. The Bible Among The Myths was a fascinating read- one that was difficult to put down. Oswalt's writing style kept me intrigued and motivated to keep turning the pages. On several occasions, I had to place the book down to think through the implications of what he was saying, which is always a good thing. He touched on many topics that will get the thinker identifying holes in other worldviews and theological positions. At the same time, though, he does take the reader into some uncomfortable territory and presents a case that will force the reader to reconsider certain positions. There were a few times that I did disagree with Oswalt, but they were nothing damaging to his conclusion. At the end he did explain how the worldview of continuity could not have evolved into the worldview of transcendence (thus that worldview cannot explain the existence of the Bible's worldview), but he leaves it at that. I would have liked to see his defense of how the worldview of transcendence could devolve into continuity, thus the worldview of the Bible could explain the existence of the mythological worldview. Perhaps that could make it into the next edition? If anyone has encountered or presented the claim that the Bible is merely mythology, I highly recommend this book. It will challenge both the believer and the skeptic by taking them through the latest research and presenting them with the necessary implications of such a claim. Check out the NEW Book Reviews Page for more. Thanks to Brian Auten at Apologtics 315 for originally publishing this review on his site. This review is only one of many in a project by Auten to build a solid collection of reviews of books of interest to Christian apologists. His collection grows on a weekly basis; check it out here.